The answer to this is very simple. To get the answers you need, you have to ask the pup itself! By understanding what puppies eat in the wild, you will learn valuable clues as to what you should be feeding your domestic pup. 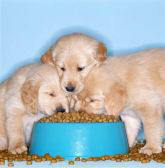 You will find out exactly what the digestive system of a puppy is programed to eat by centuries of evolution. In today's world, special foods, 'designed for growth', have become part of the processed pet food industry. They say that the foods designed for growing animals must have more nutrients that support growth compared to diets designed to maintain a grown animal in good health. This contrasts with the BARF DIET where top quality whole food ingredients are used in all the diets. Common sense tells us that our dog's ancestors have grown and reproduced using the BARF diet without the benefit of special foods for several hundred thousand years. In other words, our dogs' ancestors have grown properly, survived and reproduced on the same basic foods, no matter what stage of life they were at. Think carefully. Which environment of diet do you want your dog in? The modern environment of biologically inappropriate dog food, excessive protein, excessive calories, fast growth rates, calcium supplements, excessive exercise and bone disease, or the time honored way which produces healthy longevity, abundant reproduction and brilliant health.